The widespread pollution of our marine environment by waste plastics has become a familiar feature of our everyday lives. Go on a walk along the beach anywhere from the UK to the most remote pacific islands, and you will certainly see plastic bottles, polystyrene and other plastic debris that has been deposited by the sea. However, much harder to see are the millions of tiny pieces of plastic, collectively termed microplastics, which are polluting marine environments worldwide. Microplastics are formed either from the breakdown of large plastic debris in the marine environment, or are intentionally formed and subsequently released into the environment through waste streams. As researchers and the public have slowly realised the extent of plastic pollution, increasing amounts of pressure has been put on governments to address the issue, and introduce measures to reduce the release of plastic waste. The UK Government has responded with initiatives such as the introduction of the 5p plastic bag charge, which has resulted in an estimated 85% decrease in the number of single use plastic bags used by shoppers in England. This translated into a decrease in the number of plastic bags found on UK beaches by almost half from 2015 to 2016, as reported by the Marine Conservation Society. Unfortunately the reduction in plastic bags used by consumers in the UK is not enough. When the Marine Conservation Society released the results of its Great British Beach Clean 2015, it found that the number of pieces of beach litter per kilometre had risen by 34% from 2014 to 2015, with the majority of this litter made of plastic or polystyrene. Whilst the number of pieces of litter picked up had decreased by 4% in 2016, the Marine Conservation Society noted increases in the number of certain types of plastics, such as drinks containers, up by approximately 4%, and balloon-related litter, which had increased by over 50%. Research groups, the public, and governments are now looking at other ways of decreasing plastic pollution of the environment, and we are now starting to see acknowledgement of the microplastic problem in governments across Europe and North America. As a result of this, in a continuation of measures aimed at reducing plastic pollution, on the 3rd September 2016 the Department for Environment, Food and Rural Affairs announced plans to "ban the sale and manufacture of cosmetics and personal care products containing tiny pieces of plastic, commonly known as 'microbeads'" by the end of 2017 in the UK. Microbeads are a common ingredient in many cosmetics, and are a significant source of microplastic pollution. 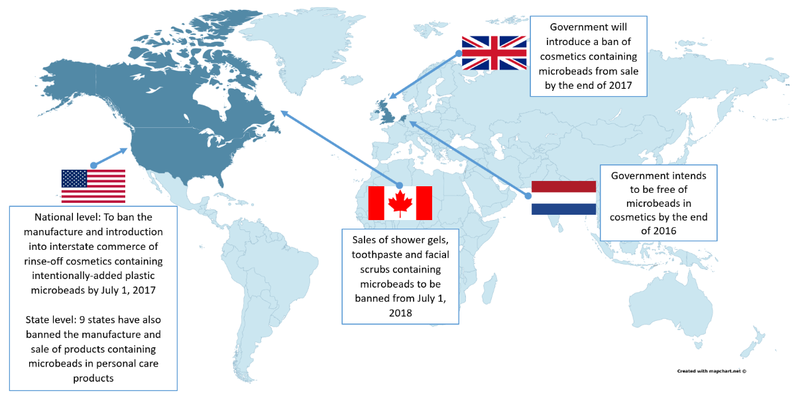 Other countries have also begun to introduce legislation regarding microbeads, including the Netherlands, Canada, and the US. The issue has also caught the attention of the EU, and there was an EU conference on Plastics on 8-9 December 2016 aimed at tackling the problem of plastic pollution and designing an EU strategy on plastics. Microbeads are added to cosmetics as an exfoliating agent, and as such are a regular ingredient of facial scrubs, toothpastes, and other cosmetics. They are solid plastic particles that are under 5mm in diameter, usually made of polyethylene (but they can also be manufactured from other polymers), and can be made in a variety of colours. Researchers at Plymouth University investigated the microbead content of six major brands of facial scrubs and found that a single use of a facewash containing microbeads could release between 4,600 and 94,500 microbeads directly into sewers. As sewage treatment processes cannot effectively filter these microplastics from waste water, they will pass freely into the marine environment, where they can act as a pollutant to marine organisms. Microbead pollution from facial scrubs alone could add up to an estimated 16-86 tonnes released per year from the UK. Microbead release through the use of cosmetics is classed as primary microplastic pollution. The Norwegian Environment Agency defines primary microplastic pollution as microplastics that are intentionally created for use, or as an inherent by-product of a process, and have a direct input to the environment, whether intentionally or unintentionally. Secondary microplastics, in contrast, are mainly formed due to the degradation of plastic debris in the sea. Categorising microplastics like this is important, as it allows us to evaluate the best methods to tackle plastic pollution – at the source or in wastewater treatment plants. In a domestic environment, one of the other major sources of primary microplastics is the release of plastic microfibres with washing machine effluent. Many clothes are at least partly manufactured using synthetic fibres, and during a wash cycle, microfibres are released from these items of clothing and washed into sewers. Studies have indicated that over 700,000 microfibres could be released from an average 6 kg wash. In fact, microfibre pollution from washing synthetic apparel is estimated to be one of the largest causes of microplastic pollution, accounting for up to 85% of microplastics found around the world. Once microplastics are released into the environment, it is virtually impossible to remove them – the only way to effectively deal with this problem is to ban the use of primary microplastics where possible, and to remove them from our waste before they are released. The introduction of legislation to ban the addition of microbeads to cosmetics is a step in the right direction. However, if we are to completely prevent primary microplastic pollution entering our environment, drastic improvements to wastewater treatment plants and domestic and industrial practices are needed. If we can reduce the output of microplastics from the source, e.g. through washing machine filters and improved manufacturing processes, we will reduce the pressure on wastewater treatment works, and reduce the plastic pollution of our environment. Chris Walkinshaw is a research scientist with an MSc in Environmental Toxicology and Pollution Monitoring, and an interest in microplastic pollution and the role this plays in the environment. He currently works as a senior research and development scientist, where he works to develop novel biochemical tests in healthcare, environmental and veterinary fields.